This exhibition surveys Conceptual art as it developed in Southern California in the 1970s. It is occasioned by the artist William Wegman's extraordinary recent gift to the Museum of 174 short videos that he made between 1970 and 1999—his entire career in this medium. A ninety-minute selection of videos from this gift is shown accompanied by photographs and drawings by Wegman as well as drawings, prints, and photographs by his contemporaries in Southern California such as John Baldessari, Vija Celmins, Douglas Huebler, Ed Ruscha, and others. 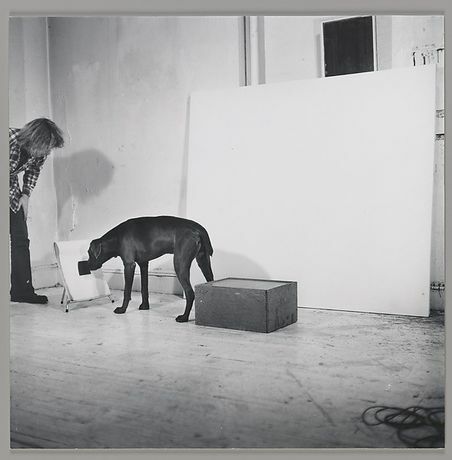 Wegman took up video while studying painting at the University of Wisconsin. Like many artists using the then-new medium, Wegman appreciated video, like photography, for its lo-fi reproducibility and anti-artistic qualities—and unlike film, where the negative must be developed and processed before viewing, video was like a sketchbook that allowed revision in real time. It wasn't until he moved to Southern California in 1970 that his video production took off. Although he only lived in Los Angeles for three years, Wegman found his method: short, staged vignettes using everyday items in which expectations are reversed, puns and homonyms are pursued to absurd conclusions. The artist's key early collaborator for most of these short videos was his pet Weimaraner Man Ray, who enthusiastically participates in the goings on. In contrast to other early adopters of video, Wegman eschewed an aesthetic of boredom for humorous improvised scenarios in which he deflated the pretensions of painting and sculpture while also lampooning the pieties and self-seriousness of Conceptual Art—at a time when it was being codified and institutionalized. Beneath the slacker humor, however, are poignant points about failure and the reversal of expectations that chime with work by fellow West Coast Conceptualist friends and fellow travelers also featured in the exhibition.